I adore the first photo! That is Christmas card material for sure! What a fun thing to have around the Christmas tree! I definitely want to do that someday! Adorable photos! I still need to take pics around the tree! And yes, it's coming up so fast!!! Aww. I love it. So cute. So cute, Jenni! 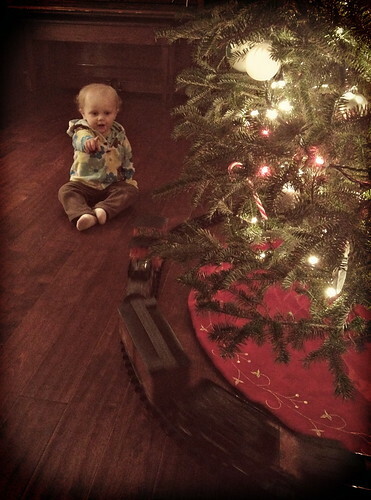 Both my kiddos are obsessed with trains too! James would FREAK over that train! How fun that they get to play with it! Such sweet shots! 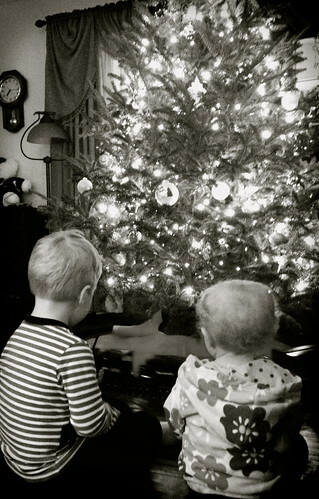 I seriously think I need to get a train set to go around the tree too! Thanks so much for stopping by and linking up. Oh, and thanks for the 11 days til Christmas reminder. *whispers* I haven't even started shopping yet. Eek! That first photo is perfect! A definite must print! Beautiful tree! I love the train going around it. I love trains under Christmas trees but I don't think I actually know anyone that has one. So sweet! My kids love choo-choo's, too!